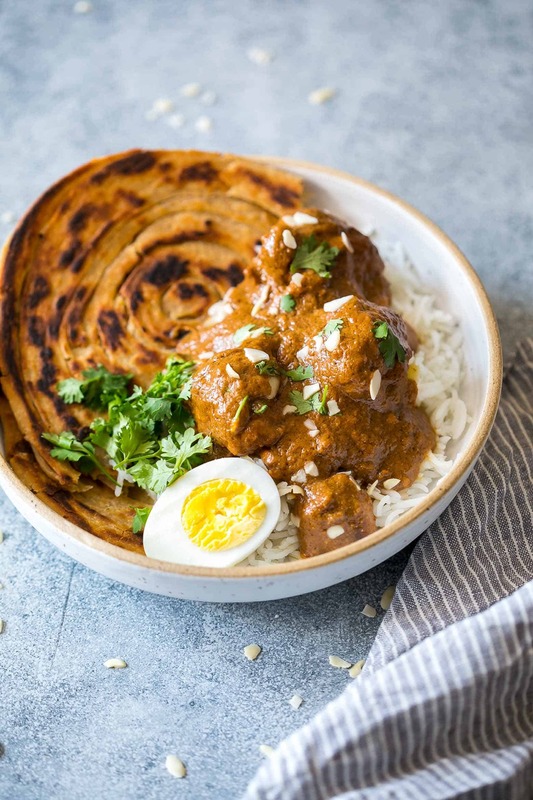 Mughlai Chicken is a restaurant style, north Indian recipe with a creamy, dark brown onion gravy that will have you licking the plate! Serve it with parathas, biryani or jeera rice, and feel free to substitute paneer if you are vegetarian. I’m going to be honest with you. Just the term mughlai is enough to put me off because I’m imagining a heavy gravy that leaves you feeling full. 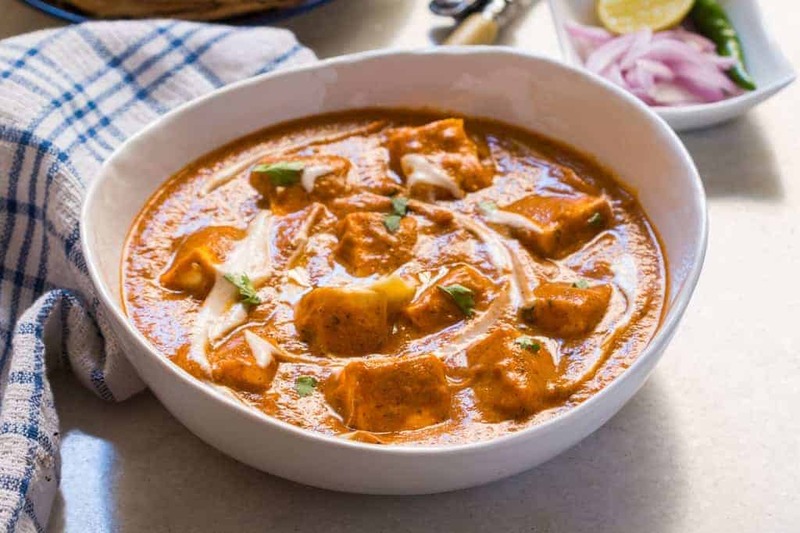 And while I’m north Indian and paneer butter masala is in my blood, I don’t like feeling like I ate a whole chicken in one sitting. But this mughlai chicken recipe changed everything. Because I could’ve never imagined the kind of magic that brown onions and creamy cashews can do with some simple spices. Mughlai to me also meant hours in the kitchen sauteeing, grinding, and basically living there for five hours sweating my body weight out. But tada! I have something that’s ready in an hour and gives you so much satisfaction that you’ll be licking the pan clean. Like I did. 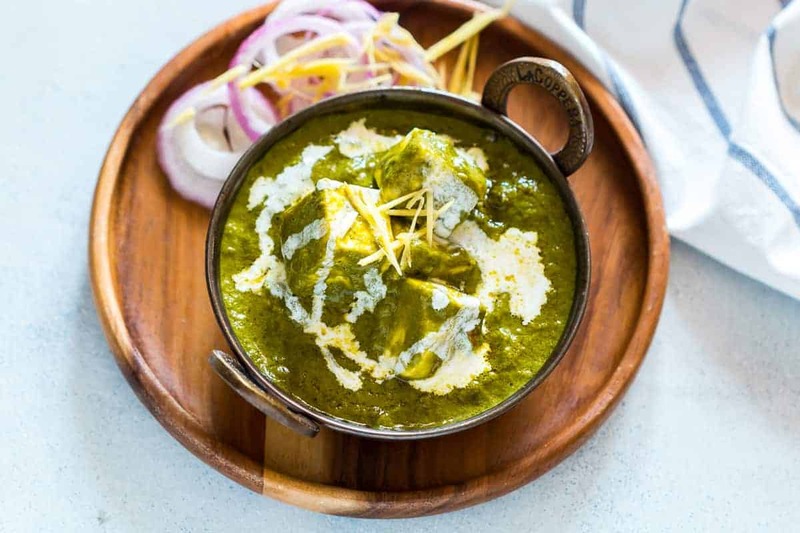 This mughlai chicken recipe is as easy as it gets. And it reminds me of something my mum used to make when I was a kiddo. You know, those warm, fuzzy, food memories that never really leave you even when you get older? That first bite of something delicious that doesn’t have a name but is almost ingrained in your memory. So that the day you taste it again, there is a light bulb moment. And you are like yesssss! Why didn’t this happen before! This recipe has exactly 15 ingredients counting salt and all. And I know that seems like a lot, but the majority of them are just spices. Not the kinds you would have to make a grocery run for, but the kinds that you probably have lying around anyway. The rest are just ghee, onions (lots of them), cashewnuts, garlic, ginger, green chillies and chicken. Not intimidating at all right? Because we ALL have these lying around fosure! 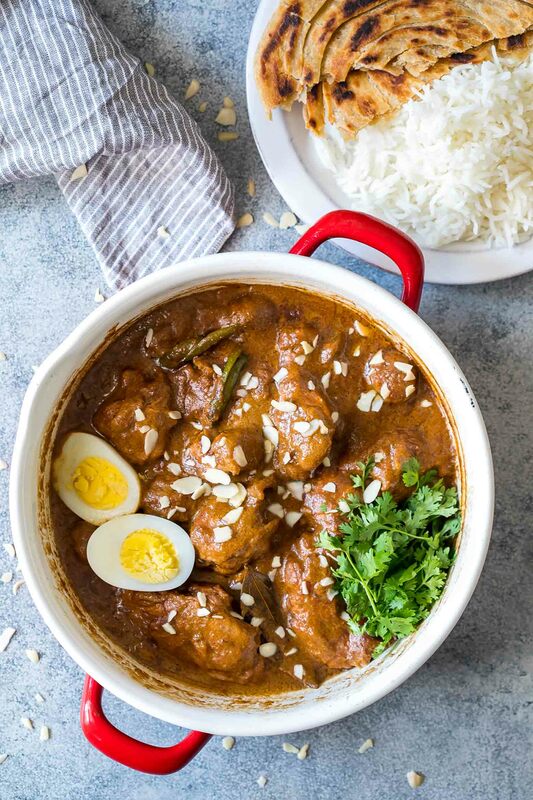 I’m hoping you’ll make this a regular Sunday afternoon affair because this mughlai chicken recipe will give you all kinds of soul satisfying, sleep inducing feels that all comfort food should have. If you do, here are my top tips for making this mughlai chicken recipe. Before you start, soak your cashewnuts in hot water. 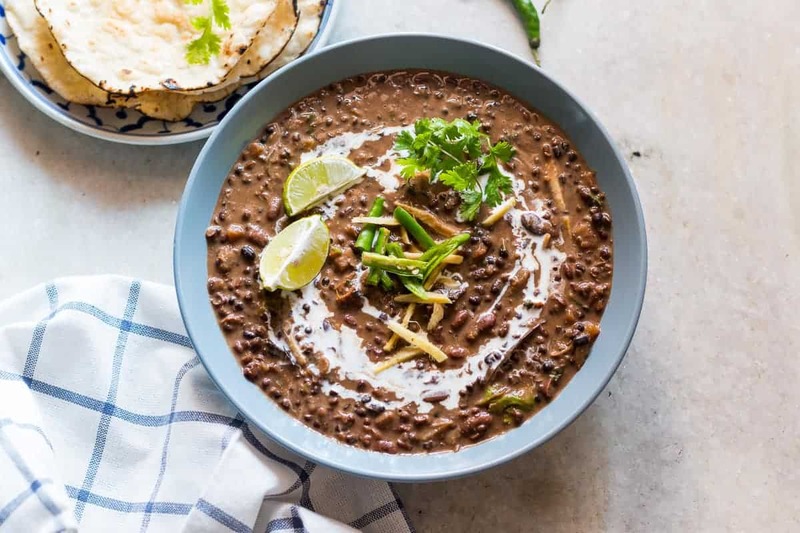 Using hot water, softens them faster so that when you grind them along with everything else, you’ll have a smooth, creamy curry without any stubborn cashew bits. Chop your onions for this recipe as fine as possible. I recommend using a food processor which will give you a nice fine chop without too much effort. This helps brown them faster and breaks them down quicker. Use bone-in chicken for this recipe. Bone-in chicken is more flavourful and definitely more juicy and has less chances of being overcooked. 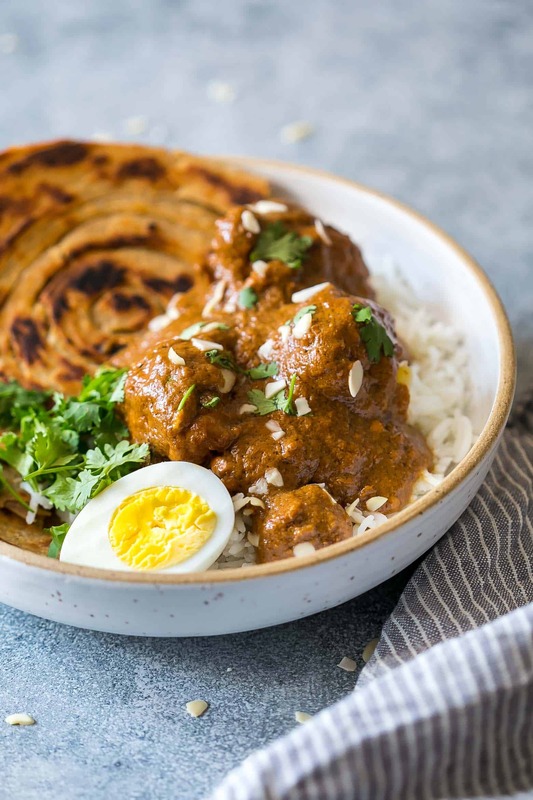 This mughlai chicken recipe tastes much better when its left to sit for a couple of hours or even overnight, which makes it perfect when you want to plan ahead for a party! To start with, soak cashewnuts in hot water for 10 minutes. Also rub turmeric powder all over the chicken. Set both things aside. Heat a tablespoon of ghee in a pan, and add the onions. Sprinkle 1/2 teaspoon salt over the onions and mix. Reduce the flame, cover and cook the onions till they are deep brown in colour. During the process of browning the onions, stir them around every 5-6 minutes to prevent them from sticking to the bottom and burning. This whole process of caramelizing the onions should take about 20 minutes. Once the onions are brown, transfer them to a food processor along with the soaked cashewnuts, garlic cloves, ginger, green chillies and 1/4 cup water. Grind to a smooth paste. Heat the remaining ghee in the same pan, and add cardamom pods, bayleaf, cloves and cinnamon. Saute for a minute or two and add the onion paste. Cook the onion paste on medium high heat, while stirring occasionally for 4-5 minutes. Add coriander powder, chilli powder, garam masala powder and salt and saute for another 2-3 minutes. Add chicken to the pan along with 1/4 cup water. Cover and cook the chicken for 20 minutes or till cooked through, while stirring the curry occasionally. This will be a thick gravy, but if you like your thinner, feel free to add a little water and bring the curry to a boil. Taste for seasoning, and finish it up by stirring in the cream. Switch off the flame. Let the curry sit for 10 minutes before serving with parathas and jeera rice. Hey Shahin, peanuts would add a completely different flavour since they have a strong flavour of them own. I recommend either cashews or almonds. Wow..this tastes good.i had it for paratha,really best combination.Thankyou for the best recipe. Perfect with parathas! So glad you liked it! Never tried freezing it, but it should. 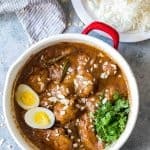 Thankyou so much for sharing this awesome receipe.My husband and kids loved it very much.I made this along with your jeera rice recipe.It tasted like heaven. I didn’t add cream as it was not available…but still the chicken came out so yummy. Thank you for the clear recipe. Glad you liked it Dhivya! The recipe is easy to follow and the chicken has turned out just as expected. Thank you for sharing this wonderful recipe. (It was my husbands request). Could you please tell me when do I put the 2 tbsp of cream? Made this receive for my son and hubby. They loved it. To make it dairy free, I used coconut milk instead of heavy cream. Still yummy and no coconut flavor! That sounds fabulous. Thanks for leaving your comment here. I’m sure it’ll help other readers who are lactose intolerant or prefer to make this dairy free. Hey Simao, the gravy is actually brownish in colour. As long as it tasted good, don’t worry so much about the colour. It could be the spices we have in our kitchen or how brown your onions were. Hi this looks amazing. Can you tell me if you used tomatoes and if not how you got such a vibrant colour. Hey Ashi, there are no tomatoes in the recipe. The colour is from the onions that are cooked slowly till they brown. Richa, I cannot wait to make this tomorrow, it looks and sounds so delicious! I had no idea what I was going to cook for meals this week, which is unusual, and I walked up and down the aisles of the supermarket waiting for inspiration to jump out at me – which it didn’t. Then I got home from work, checked my email and your newsletter in the first email in my inbox with this recipe staring out at me. Bingo! I’m so happy you found your recipe for the week in my newsletter 🙂 I hope you enjoy making this! Yaaay! So glad you liked it! Thanks so much Ruchira. Really glad you liked it! Thanks so much Ruchira! Really glad you liked it.